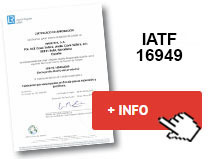 INKATOR S.A. has a Quality System certified by Norms IATF 16949. All the improvements, special innovations and special requirements are attached to this system. 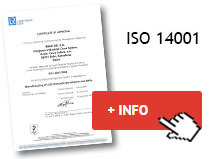 INKATOR S.A. develops its processes fulfilling the legal and prescribed requirements, paying special attention to Security requirements, and proceeding day by day in the Environment protection, having a Management of Prevention and Labour Health System and an Environmental Management System certified in ISO 14.001.